18 pages were found with this tag. Presented at the PMI Global Congress 2015 in London. In this podcast, Ricardo talks about the effort driven tasks. He explains their advantages and how we can use them in our project management. In this podcast, Ricardo continues to talk about the types of relationships between the activities in the schedule. Today he tackles the Finish-to-Finish and the Start-to-Finish types. At the end, he leaves a great tip. In this first podcast of two, Ricardo talks about the types of relationships between the activities in the schedule. It's a simple concept but a lot of people do not fully understand when putting it into practice. This week, Ricardo explains when to use the Finish-to-Start and Start-to-Start links. Next week, he will talk about the remaining two types, the End-to-End, and Start-to-Finish. How to measure how far you are to finish a task where creativity is relevant and inspiration can accelerate or decelerate the progress? In this podcast, Ricardo talks about how we can best measure the real physical progress of the project and explains the application of the concept of anchoring and the WBS decomposition. Why it is worth using the 3-point estimates to determine the project duration? In this podcast, Ricardo talks about the advantage of making three-point estimates. He gives tips on how we can obtain more effectively estimates from team members and how we can quickly get important information about the project. 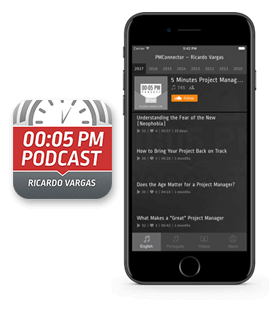 In this podcast, Ricardo Vargas discusses the main differences between replanning and rescheduling a project. Although both have as their objective to apply the decisions of the change control process, the approach and scope of changes in each case are significantly different. In this podcast, Ricardo talks about mandatory dependencies and discretionary dependencies between the activities of the project. He explains that a mandatory dependency is one that needs to be physically respected and discretionary is one that is made to generate a greater benefit for the project, whether in management or in the results. Ricardo also shows several examples of these two relations of dependence. In this podcast, Ricardo explains the concept of "Parkinson's Law" on projects and how to prepare a feasible schedule to avoid the law. He gives tips on how to develop work packages to be are easier to measure.